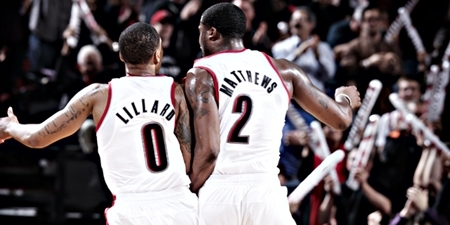 Lillard and Matthews playing a huge role in the Trailblazer’s early dominance. The Western Conference’s Northwest Division was supposed to be an easy one for the Oklahoma City Thunder to take. The Portland Trailblazers so far have disagreed. Let’s break down the conference and its standings, even though its very early on in the season. The Trailblazers have started the season blisteringly hot. They are tied for the NBA’s second best win-loss record. Led by the youthful back court of Damien Lillard and Wesley Matthews. Lillard, the second year Point Guard, is currently averaging 19.9 points, 5.8 assists, 3.9 rebounds per game. The Trailblazers also have one of the most talented Power Forwards in the league in LaMarcus Aldridge. Aldridge is having a season of resurgence, currently averaging 22.6 points a game. The Trailblazers go basically 10 deep on the depth chart, this should help them sustain a good start, and leave them in contention for a Northwest Division Title. The Oklahoma City Thunder got a huge treat by getting the athletic Point Guard Russell Westbrook back more than a month early. With out Westbrook in the line up early on Kevin Durant and the Thunder seemed out of synch, often becoming very stagnant on offense in the fourth quarter of games, passing only to the leagues leading scorer in Durant, who would often draw double and triple teams. With Westbrook back the Thunder have much more flexibility on offense, especially in the fourth quarter. The Thunder are one of only three teams in the NBA with an undefeated record at home. Head Coach for the Thunder, Scott Brooks, has to be thankful for “loud city” and all that the OKC community has brought to the table at home games. The Thunder will look to continue their winning ways to obtain the Northwest Division Crown. The Denver Nuggets seemed to start the season off rather slowly, but have regained momentum and have won five straight games. The Nuggets resigned Nate Robinson in the off season. Robinson, who can come off the bench at any moment and electrify a ball game has made a difference in the team early on. The “Manimal” or Kevin Farried, is one of the leagues most explosive and athletic players, something the Nuggets desperately need to coincide with head coach Brian Shaw’s style of offense. Shaw is a rookie Head Coach, and is looking to make some noise in the Northwest Division, but transactions to acquire more talent may be necessary. The Minnesota Timberwolves have had to face a fairly rigorous schedule early on this season. The Timberwolves welcomed Point Guard Ricky Rubio and star Power Forward Kevin Love back to the starting rotation. Head Coach Rick Adelman believes the T-Wolves posses enough talent to make a playoff push, the challenge is keeping the team healthy. The All Star caliber Point Guard Rubio was injured much of last season. If the Timberwolves want to make a run for the Division Title they will need to keep a healthy roster, something they’ve had lots of trouble doing.